Facebook allows users to add emails to their accounts. In this age of information and technology, it is uncommon for people to have a single email. Most people maintain at least two emails – one for business and the other for personal use. If you want to change or add email on Facebook, then this article is for you. You can use your computer to add email to your Facebook account. Using multiple emails on Facebook has its benefits. For one, if you have registered a work email on Facebook and you are moving on to a new company, associating a new email address to your Facebook account allows you to maintain full control over your Facebook account. This article will outline the step-by-step procedures on how to change or add email on Facebook. 1.Open your preferred browser. For demonstration purposes, let’s use Google Chrome but you can always use any browser of your choice. 2. Click the Account button at the top right corner of the screen. 4.On the General Account Settings section, click on your main email address or click edit button. 5.Then, click on Add another email or Mobile number. 6.For demonstration purposes, add another email address and click Add button. 7.Confirm the action by going to your email address and clicking on the message that says, New email address added on Facebook. 8.Go back to your Facebook page and reload it. 9.You will see a new email address was successfully added aside from your main email address. 10.Select the newly added email address and click on Save Change. 11.A dialog box will appear asking you to retype your Facebook password in order to proceed. 12.Now, you have successfully changed or added an email address on your Facebook account. Q: Can I have more than two emails on my Facebook account? A: Facebook only allows uses to have two emails on their Facebook accounts. Allowing another email on your Facebook account should help you with any issues you may encounter with your original email. Allowing to add more emails on your Facebook account may be an overkill and won’t be of much help. If you want to have a new email on your account, delete an old one to give a space for the new email address. Q: I forgot my Facebook password. 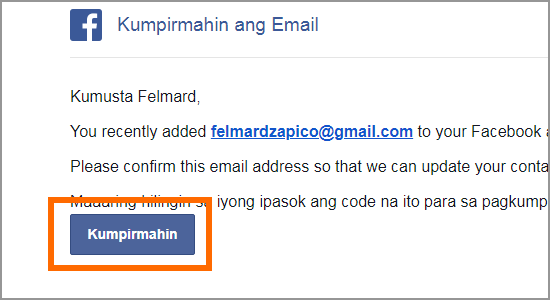 Can I add a new email on my Facebook account if I forgot my Facebook password? A: You cannot add an email address to your Facebook account if you forgot your password. Even if your login details are cached in the browser, Facebook will require users to re-enter their password in cases where changes to your Facebook details are not authorized. Q: Can I use any email address to add to my Facebook account? A: You can use any email address as long as the email is tagged as spam or disposable. We discourage users to use disposable mails (even if they go undetected) as they are prone to be deleted or hacked. You just learned how to change or add email on Facebook. If you have questions about any of the steps above, let us know in the comments section.